Martin Keoghan and Diarmuid O'Keeffe when the sides met in April. KILKENNY HAVE NAMED their starting XV which will take on Wexford in their Leinster Senior Hurling Championship meeting at Nowlan Park tomorrow evening. 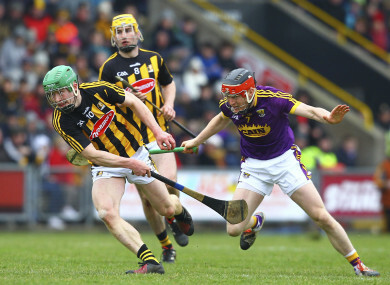 In what could be arguably be deemed a provincial semi-final with both sides on four points heading into the final round of the round-robin series, a win for either will ensure their passage to this year’s Leinster final to face Galway. Brian Cody has named Colin Fennelly on the bench, with John Donnelly, Walter Walsh and Luke Scanlon named at full-forward. Throw-in at Nowland Park is at 7.00pm. Email “Fennelly drops to the bench as Cats seek to book provincial decider against Galway”. Feedback on “Fennelly drops to the bench as Cats seek to book provincial decider against Galway”.